Sitting across their dining table from the owners of the Rocky Mountain Divi- sion of National Barn Company, this weeks Black Forest Business of the week, you are immedi- ately put at ease by Tim and Cheryl Andersen. Conversation flows as if we have known each other for years. When BFN asks what their favorite memory is, the memory of the now 61 year old pole barn builder is clear as he sorts in his mind, through the four to five hundred different construction projects he has supervised since 2005 when he and his wife Cheryl opened the business. A two year old walking down the railroad track gave the guy in the pickup truck exact directions how to get him home to his Security, Colorado home, and remembers standing on the loading chute at his uncles Fowler, Colorado cattle ranch in his “bibs” talking with his father, about six months later. Maybe not his favorite, but definitely his oldest memory. Tim Andersen, the two year old track voyager, fit’s the definition of “army brat” perfectly. Born in Germany, and moving twenty one times with his U.S. Army Corp of Engineers father, with stops in Panama, Japan, and Korea, Tim is proud of the military connection in his roots. Cheryl is also a military kid, the daughter of an Air Force father who was stationed in Alaska and The Academy during her youth. Cheryl grew up in the shadow of Pikes Peak, graduating from Air Academy High School. Her love of the outdoors and hiking often found her in the Black Forest as a youth. Years later, after Tim’s almost thirty year career with Sinton’s Dairy, and Cheryl’s tenure with a computer chip manufacturer, they find each other at a church retreat that both were reluctant to at- tend; and start an adventure together, Tim “knew it when I met her”. In 2001, their wedding reception was held at LaForet. They had more in common than they realized, including a love for Harley riding. 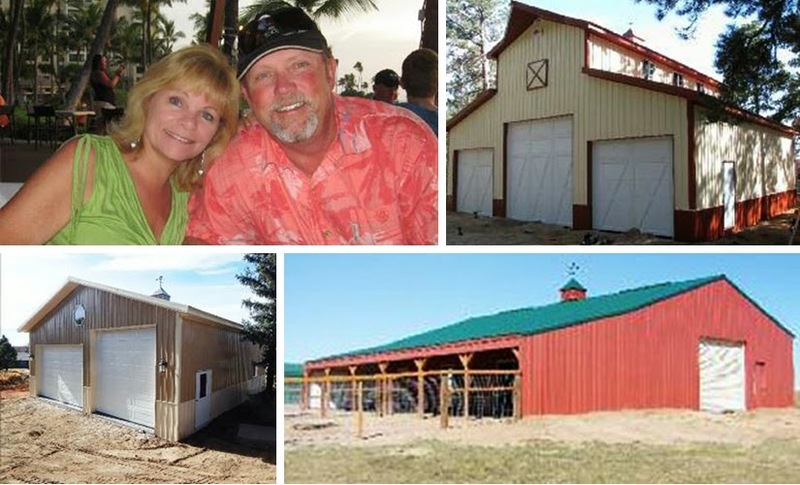 As a team running this National Barn franchise being a post frame builder in Colorado, one of Tim’s favorite projects is the red and white post frame barn located near Swan and Herring that belongs to Chuck Harris. But that is not the only favorite – he can name something about several other “jobs” built in the Black Forest. As was in their lives so far, their construction business is based in the Black Forest. Cheryl refers to it as “a God Thing” and says her favorite part of the business, she loves the customers and is proud to finish all company correspondence with “God bless”. Tim gladly wears his fish and cross belt wherever his business takes him. So much of what they do in the Forest is enjoyed because of the people they meet through their business, they seem to typify the way the Andersen’s do business. As they see it, everything comes to them through the source that recognizes integrity and honesty.